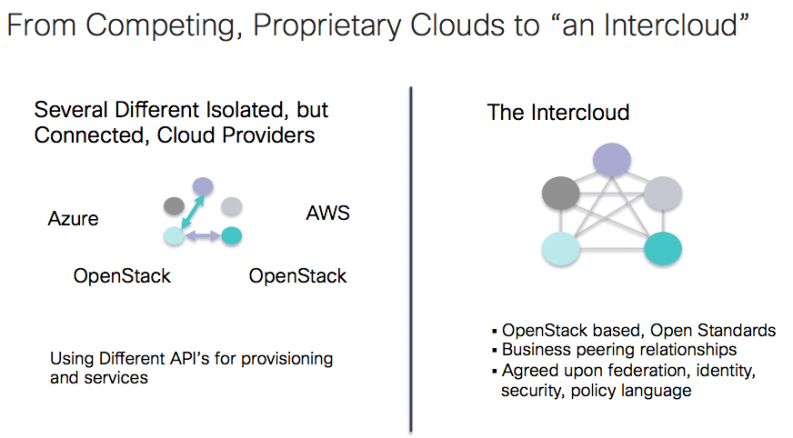 At the OpenStack Summit in Paris, Cisco’s own Lew Tucker discussed the next step forward in cloud computing — the Intercloud. Lew Tucker is CTO of cloud computing at Cisco, and has been involved with the OpenStack community since the very beginning. At the outset of his talk at the Paris Summit 2 weeks ago, Lew said a curious thing that made us sit up and take notice. 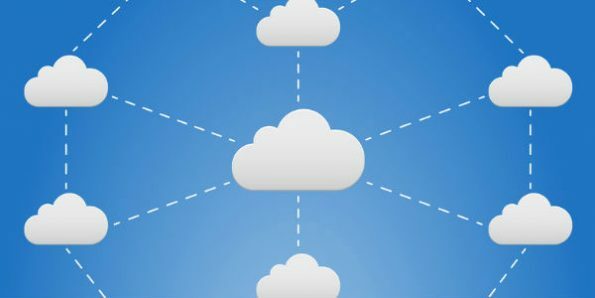 Tucker called this idea an Intercloud — the notion of moving from the isolated clouds of today, to an interoperating, if heterogenous, network of compute not unlike the Internet itself. For Tucker, the recent Juno release is a harbinger of such things to come. 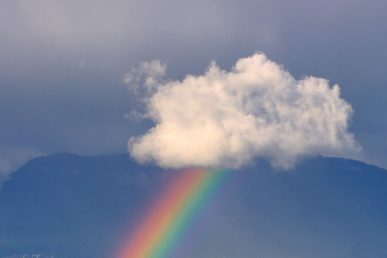 Further, the Intercloud shouldn’t be a happy accident down the road, or a nicety. The Intercloud should be, in his opinion, something that we actively work to make happen, an explicit goal, even despite some of the near-term deterrents. “We should all be really, really proud,” he said, careful to start with recent successes. But, Tucker continued, the real question is: “where is OpenStack going next? “I know on the Foundation and on the technical committee, we’re having a lot of these discussions. Can we keep OpenStack as one thing while it covers a lot of these different use cases, these different markets? I believe we can,” said Tucker. But he warned that designing for the future is paramount; a long-term view is essential. So, how does the kind of intraoperation that Tucker described (and that Cisco conceivably wants to see) come to pass? Here’s a recap of the talk and its most important points. If you want to watch Lew’s full presentation, the video is embedded at the bottom of this post. If we can’t win the enterprise, the future is bleak. Even though “we may be saying this is all about new cloud applications, AKA cloud native applications,” Tucker emphasized the unavoidable truth that “IT shops control most of the spend,” and as such they have a disproportionate influence on how the future actually comes to pass, despite whatever our best intentions may be otherwise. We have to be able to bring a cloud into these IT shops, and teach them how to “move those applications onto a cloud platform in a way they find satisfying." Cloud computing is absolutely winning in the strategic sense, and it’s the only real growth area right now in IT; the mandate is clear, Tucker argued. But the implication, of course, is that we’ve not yet won IT; it’s easy to say that we have, or will soon. But the intellectually honest position is that the battle for the enterprise is still nascent. The reality of the move to the cloud for IT that Tucker described is more non-trivial than most acknowledge publicly, and this reporter, among others, appreciated his candor. We have to bring up the rear, so to speak; an Intercloud isn’t possible when so many IT operations are off pace. And that’s not a critique of them, Tucker suggested. It is rather a challenge for us, for our community, and the platforms and services we provide. We cannot expect the enterprise to come to us; “win” isn’t the right word. It’s just as possible we’ll lose, if we’re not emphatic, and humble, and again, in service to our users, wherever they may be. We’re really trying to bring the operators together, get them closer to the whole community here, and interoperating these groups is an essential precursor to any “many clouds” vision, technologically speaking. As was a theme elsewhere at the Summit, cultural norms and community development are not just a surrogate for technological prowess; they are in fact a driver of it. Tucker fully expects to see a couple of new generations of network services in quick succession, and he thinks that’s a very good thing for the Intercloud vision. But as the argument goes, that’s not going to be sufficient. The next generation will bring truly distributed systems, Tucker argued. And that’s where it gets interesting. Of course, that’s not the way such boxes were designed originally, but they do have networking protocols that allow you to do what Tucker describes, today, and he clearly thinks that this will be a very fertile area of innovation over the next couple of years. Tucker emphasized how many new (and how many different) devices we have coming online. But, Tucker argued, now that we are connecting mobile devices, handheld devices, sensors, and more, we know that there’s an even larger swarm of these devices going out into the rest of the world, year after year. We’re just getting started in that sense. “Its interesting. We’ve got some people here from Cisco who’ve been working on using OpenStack to manage all of these different kinds of devices, and that I think is another interesting play." 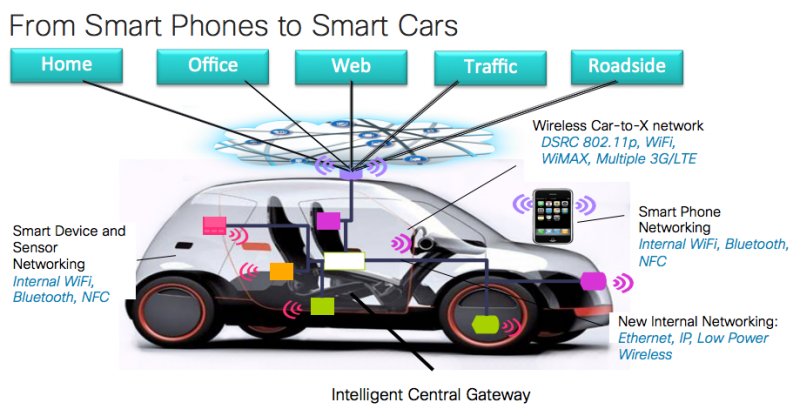 “We are also going to see OpenStack in cars” on a long enough timeline. They are, after all, just “network-based systems,” Tucker noted. In fact, Tucker argued, what we’re seeing is that more and more management systems are moving into the cloud — cars are just one of a myriad of new endpoints that need upstream infrastructure. Can OpenStack eventually serve as that kind of connected device fabric, outside of the data center? Last but not least, for Intercloud to be a reality, lets be honest, “it’s a lot of business negotiations,” Tucker said. Take the example Tucker gave of the way that telephone systems work — there are a lot of serious and complex business relationships behind the infrastructure that we today take for granted, making it so that many simultaneous parties can, among other things, carry each other’s traffic. Tucker was emphatic that he doesn’t yet know what those protocols are, and rather wants us to start thinking about them so that the entire community can begin designing them into our systems. Such protocols would, among other things, make new kinds of service marketplaces and exchanges possible so that companies can develop applications and put them into an app exchange or something similar, which would in turn be easily consumed by any variety of different clouds. One of the things Tucker hears all the time as he is talking to customers about OpenStack, is that they don’t want vendor lock-in. But despite that (encouraged) heterogeny, Tucker clearly insists that having a common model means you can have a larger market in which to play overall. That, for him, is the essential notion of OpenStack, and a way to have our cake and eat it too. “So what, really, what is our future here?” Tucker asked the audience. Tucker quickly turned back the clock to look back at how this same process (a network of networks, so to speak) happened for the Internet. Before of course, there used to be lots of different networks, and that you would move from one network to another network, each with different protocols involved. This wasn’t done by one company, Tucker emphasized. You had AT&T, working with Level 3, working with Verizon, Google, Trident Telecom, Cisco and, hundreds of other companies as well, through these different kinds of distributed computing protocols that allowed us to truly interoperate, sending packets around to the world. Of course, mistakes can happen. Famously, at one point, two-thirds of the Internet’s YouTube traffic went through Pakistan and Pakistan was blocking it, so it went into a black hole. There were even 18 minutes that China Telecom essentially hijacked all of the traffic from Verizon, Tucker claimed. Both of these were believed to be human error, not malevolent action. The crowd nodded in agreement. 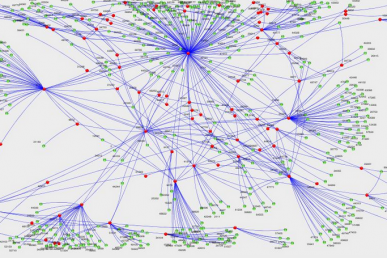 And so, will OpenStack be the community that builds this Intercloud? To learn more, see Lew Tucker’s entire talk at the OpenStack Summit in Paris. Part 2 of Lew Tucker’s Paris Summit session reveals the strategy guiding Cisco’s corporate strategy as it relates to OpenStack. 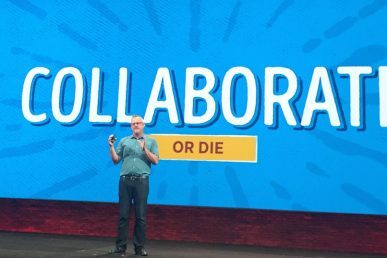 Mark Collier, OpenStack Foundation COO, lays it on the line in day two of the Summit keynote. Also, smart cities, even smarter scientists and the next Hackathon.